While studying pedagogy and educational theory at the University of Rome in 1897, Maria Montessori began to develop a philosophy and method of education. Based on her observations and research, she concluded that the problems experienced by the children she was working with were educational and not resulting from social, medical or economic causes. In 1907 she opened her first classroom, the Casa dei Bambini, or Children’s House in a tenement building in Rome. Through scientific methods of experimentation and observation, Dr. Montessori uncovered many startling discoveries about children which lead to the formation of her world famous Montessori method of education. Her scientific pedagogy revealed amazing behaviours in children which challenged previously held ideas about children and education. Amongst her key revelations, Dr. Montessori concluded that children have an amazing ability to concentrate for long periods of time if they could choose tasks that interested them. Up until this point it was commonly believed that children had short attention spans with little or no capacity for accomplishment. Maria Montessori understood that children were naturally drawn to work and not play. Their preferred tasks included activities working in a kitchen, baking real food or cleaning actual furniture as opposed to pretending to do these tasks with replicas (toys). Maria Montessori noticed the children’s sense of pride resulting from real ‘work’ motivated them toward greater achievement and a sense of accomplishment. 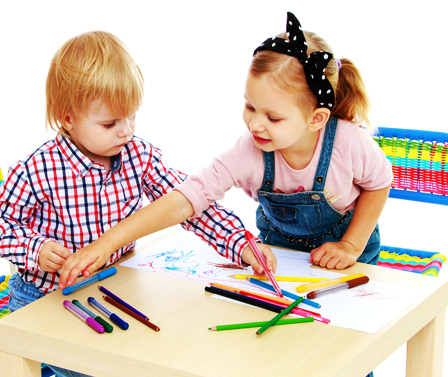 As opposed to the common notion of children being ‘messy’, Dr. Montessori determined that they have a natural inclination toward order and cleanliness. She noticed a sense of calm in the children which they derived from organization, order and routine. Her method facilitates this process. Maria Montessori recognized that children desire to choose the things they do and when the opportunity to choose is accommodated, children function impressively well with a greater sense of ease and enjoyment than they would if they were not given the choice. She observed that each child develops at a different pace than the next, and if provided with the appropriate materials and environment specifically designed for his or her unique needs, all children exhibit a spontaneous desire to learn. These examples typify the countless determinations which spread worldwide by the early 1900’s and became the basis of the famous Montessori method of education taught in thousands of Montessori schools worldwide today.